Graham crackers dunked in a glass of cold milk. I sure have missed this small, sweet treat at the end of an evening. There’s something humble about a graham cracker. (And terribly mis-named. These are only cracker in shape. Really, these are a slight sweet cookie.) It stands at your side, waiting for your attention. It doesn’t shout or shimmy, or demand more from you than you can give. Graham crackers are quiet. Dependable as comfortable shoes. Always there. Except, of course, if you are gluten-free. The only commercially sold, gluten-free graham crackers I have ever eaten are laden with too much sweetness. When I looked for graham crackers that taste faintly of honey, instead of cloying the mouth with it, I have run out of luck. I wanted a cracker that tasted something like a digestive biscuit, with a bit more cinnamon and kick to it. I had to make it myself. Little Bean and I have stood at the counter nearly every afternoon for the past two weeks, gathering the bags of flours, fluffing them into the scale, cutting up butter and listening to the particular pitch of the food processor when the dough reached the desired pliability. Every afternoon, Little Bean reached for the dough and slapped it with her small hand. I taught her that. I want her to know the feel of the dough, rather than a recipe in a book. Batch #6? We had it. I made slight variations on it the next days and I was done. Little Bean has eaten graham crackers warm out of the oven every day this week. Today, she had her first taste of s’more. She started smiling as soon as it hit her lips. Of course, graham crackers come in handy for crusts, too. This is a banana cream pudding pie, made this afternoon with the leftover scraps that didn’t look pretty from all these baking endeavors. Danny made it for us before he went to work. I’m glad that she’ll grow up with graham crackers. Once you make these graham crackers a few times, I swear you could make them in your sleep. Don’t be put off by the number of steps. These are easy. Soon, you could be baking them every weekend. A few words about the ingredients. I played with a number of flours, and these four worked best in our kitchen. If you can find super-fine brown rice flour, the graham crackers shouldn’t have a bit of grit to them. If you can’t find it, try putting some brown rice flour in your blender and running it for a few moments. That usually does the trick. If you can’t find these flours, then use the same weight of flour with your own combination until you find the ones that work for you. You might notice that there is no sugar in these crackers. I’m playing with baking only with honey. Since honey is an essential taste in graham crackers, this was a natural. These graham crackers are only faintly sweet, which is how we like them. If you want more, try adding 2 ounces of dark brown sugar and taking out 1 ounce of the honey. See how that works for you. If you use your favorite non-dairy butter substitute, these could be gluten-free, dairy-free, and sugar-free! Start measuring. Remember that I’ve been telling you about baking by weight? That baking by measuring ounces into a bowl perched on a kitchen scale makes everything more creative? This recipe is a prime example. Even, for me, a painful example. You see, I tested every batch by ounces (or grams). Even when I started by converting traditional recipes, I translated the cups into ounces before I began. Not once did I put flours into a cup. Instead, I flung them into the bowl and started baking. Once I figured out the ratio of flours to fats to liquids that worked for gluten-free, I stopped looking at other recipes. I just made these. To write this recipe, I had to convert the ounces back to cup measurements for those of you who don’t have a scale yet. Normally, I’d go into the kitchen to carefully weigh flours then scoop them into a measuring cup. I have written measurements here that I will never use myself. Today, however, the scale’s battery died. (Poor thing. I used it all up.) So I had to convert ounces into cup measurements by searching for the weights of each flour and doing more algebra than I have since the 7th grade to figure out how many portions of cups each flour requires. And tell truth, it still isn’t going to be exact. “About 1/2 of cup” could be seven different weights for seven different bakers. Hopefully, these crisp crackers with the soft bite, sprinkled with cinnamon sugar, warm out of the oven will convince you once and for all. Buy a kitchen scale and start baking! Combining the dry ingredients. Measure out the sorghum, brown rice, tapioca, and sweet rice flours. Put into a food processor and whirl them up. Add the cinnamon, baking powder, xanthan and guar gums, and salt. Mix until everything is well combined. Cutting in the butter. Cut the butter into small pieces (about 1/2 tablespoon size). Add to the flours in the food processor. Pulse until the butter is incorporated into the flours. The mixture should have a coarse, sandy texture, like cornmeal. Finishing the dough. Stir together the honey and 3 tablespoons of the water. With the food processor running, pour in the honeyed water. Let the food processor run for a few minutes, allowing the dough to form a ball. The final dough should be soft and pliable, even a bit wet. If it still has not come together entirely after a few minutes of processing, add the remaining cold water, a tablespoon at a time. Preheating the oven. Preheat the oven to 325°. Line a sheet tray with parchment paper. Have another piece of parchment paper, same size, ready as well. Rolling out the graham crackers. Cut the ball of dough in half. Return the other half to the refrigerator. Put the ball of dough onto the parchment-lined sheet tray. Cover it with the other piece of parchment paper. Carefully, roll out the dough to a rectangle about 1/2 the length of the sheet tray, or until the dough is about 1/4-inch thick. Cut the dough into 8 pieces. (You’ll have ragged round pieces on the edges. Leave them on. They’ll make great scraps for graham cracker crusts.) If you want the final crackers dusted with cinnamon sugar, do that here. Refrigerate the dough for 15 minutes. Decorating and baking. Pull the sheet tray from the refrigerator. Using the tines of a fork, prick holes into the crackers in a regular pattern that looks good to you. Bake the graham crackers until they are golden-warm brown and starting to be hard, about 15 to 20 minutes. (Turning the tray halfway through baking will help them to not bake too brown.) Allow them to cool on the sheet tray until they are cool to the touch and hardened even more, about 30 minutes. Repeat with the second half of the dough ball. Eat. Dunk in milk. Make s’mores. Enjoy. Oh Shauna, these look amazing! I plan on making them this week for my kids, I've got all the ingredients and a kitchen scale so I am set. They will be thrilled! I've never made GF graham crackers before so I'll let you know how mine come out. I love the story about the 3 little bears and little bean. The next time I get into testing new baking recipes I'll use that with my boys. They absolutely love to help me in the kitchen. This morning I had all 4 of them at the stove making teff pancakes! I wish she’d included the teff pancake recipe… sigh. Thank you for the graham cracker recipe! I’m late finding it, but this will be very nice to have for my little one (Gluten-intolerant) and his grandpa (my dad, celiac). Sigh. if only I could get sorghum and sweet rice flour here. Order online! I live way in the middle of nowhere and order from Bobs Red Mill ALL the time! its really affordable especailly when you get the 25 pound bags! Oh wow! I can't wait to try these with the kiddos today. I never thought we would get graham crackers or smores again. Thanks. I'm curious, because I've heard that the distinctive taste of graham crackers comes from graham flour… are these missing that taste? After reading your blog, I've been eating gluten-free for the past 5 or so days, and I'm feeling great! I didn't have any specific health reason to do it, just an experiment. Anyway, thanks for the inspiration! Sarah, you’re not alone trying this. My boyfriend suspects he may have a slight gluten sensitivity, but nothing life threatening, but it doesn’t harm me at all. However I’ve been doing it along with him for support and just to see how it would make me feel. We’ve been gluten-free for the last 2 months and we both have noticed such a difference. It’s truly amazing coming into this in a time when Gluten-Free is just starting to go mainstream. My heart goes out to all with sensitivity or intolerance to Gluten before this time. It must’ve been very difficult. Have a great day! You might appreciate this story: last night I saw a pic of your smores on flickr before going to bed. This morning, I dreamed that I had accidently eaten a regular graham cracker, and I freaked out and started crying because I knew I was going to have a strong reaction. Then the alarm went off and I was so thankful that I hadn't actually eaten that much gluten! I'm so glad you're here to come up with gluten-free alternatives for us! Glad to know I’m not the only one that has dreams about eating gluten, only to wake up and sigh with relief that it was only a dream. After finding out 3 years ago that I have celiac disease, I’m glad I can still make things so I feel “normal” when eating with my friends. At least I can join in the s’more merriment around the campfires this summer with my own graham crackers. my littlest camper will be so thrilled next campfire to not be the only wee one trying to make a s'more out of store bought GF frankencrackers. Is sweet rice flour, white rice flour? I can only buy white rice flour and brown rice flour. sweet rice flour (also known as sticky rice or glutinous rice flour), and other GF flours can be found at oriental supply stores dirt cheap!!!! check it out. Thanks Jude! I just went to one today. They had buckwheat, millet flour, and tapioca starch pretty cheap too. What a great suggestion! Also, isn’t it an oxymoron that glutinous flour is gluten-free. haha. Thanks Shauna! I can't wait to try them! Thank you. Reading this made me so happy I started to cry. I can eat graham crackers again! Thank you, thank you, thank you. Yeah! I've been feeling sorry for myself for not being able to enjoy S'mores with my two daughters. Can't wait to make these with them! A bonfire and s'mores my favorite! Yahoo! I am gonna make these today. Can't wait, my niece and nephew will be so happy to have gf graham crackers. Thank you so much for sharing. These look delicious! Recently I have been thinking of making my own gluten free graham cracker recipe – it's funny that around the time I have been having thoughts you post a recipe! These look thicker than I would like, but I am loving the concept and the way you told the story. Thanks Shauna! I cannot wait to make these! Thank you Shauna and Danny! And I'm so excited that you are using weighted measurements … so much easier (and fewer dishes to wash at the end!). I salute you Shauna for your talent, determination and most sincerely for posting the recipes!! These look beatuiful. I'll bookmark this for later use. Again- you amaze me. YAY YAY YAY!!!!!!!!!!!! 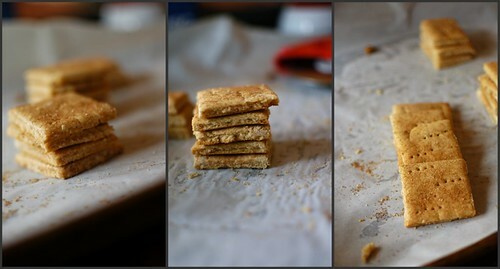 I love graham crackers and especially making them. I was so sad this fall when I had to go gluten free to realize I would never have a s'more again! But you have saved the day Shauna! Thank you a million times over!!!! Oh joy! 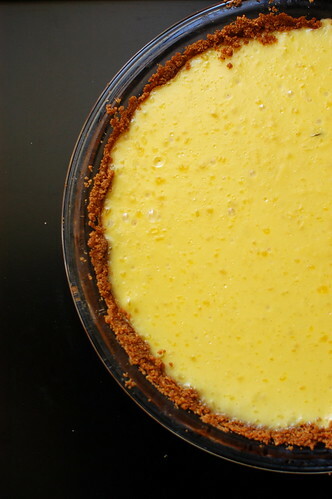 I can finally make my Key Lime Pie with a gluten-free graham cracker crust for Booth… I've tried putting it in my GF tart crust, but it just ain't the same. You are a delicious wonder. I have been waiting for these, many thanks! I agree, the graham type crackers I have tasted were too sweet. Looking forward to making these. And I got a scale for Christmas, so I'm all set. You made my day! i am so happy there are people like you, wiling to do all the work for people like me. 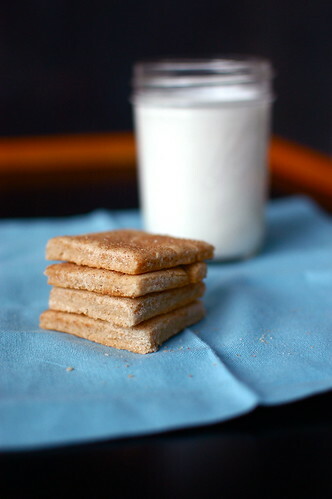 i bought a scale, can't wait for the cookbook, and to make these graham crackers! I've been salivating ever since you mentioned these a few weeks ago….THANK YOU. What is the ratio of flours to fats to liquids for GF baking? Is it the same for all baked goods or unique to each type of baked good? Yes! I have all of the ingredients to make these! @Chelsey There is White Rice Flour, and then there is Sweet White Rice Flour under the brand name Mochiko (usually). Sweet white rice flour has a stickier consistency when water is added to it which is needed in making things like mochi cakes or in this case if you needed that stickier, chewier quality. It's also sweet. Finally, the answer to gluten-free girl scout prayers. Thank you for your diligence and care. I can't wait to make these this weekend, the girls are just getting sick of gluten free sourdough. And now when the kids go to Coronet bay for the environmental learning time, the proud gluten free 5th graders (all 6 of them in a class of 35) can have smores round the fire with the rest of the class. Mmmm…those look so good. I'm with cottagesweet though, no immediate access to flours. I have to order them. I want to try this though when I can. I can't wait to try this recipe! 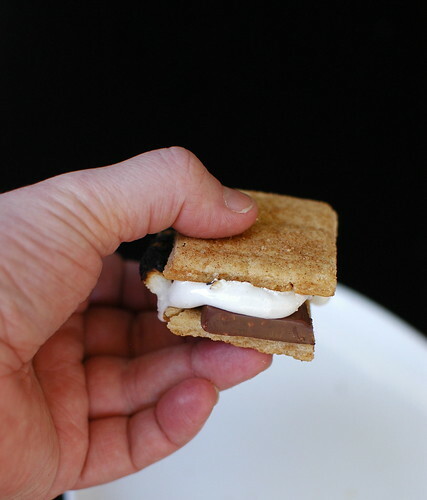 I've been using a GF cereal to make a graham cracker crust for pies, but we've had to pass on the campfire s'mores! And I love that kiddos can make these treats too! I'm really excited to try these soon. They look amazing! My 5 yo son is gluten-intolerant and graham crackers are one of the things he has missed most. These look so delightful! & great idea to use some of the 'mismixes' for crusts!! For those folks 'other places' – remember, you can order from Bob's Red Mill!! I took a field trip there with friends before going gluten free, as I wanted some coconut flour (which I put in most sweet things I bake, & will prob try in this recipe) & it's an amazing place!! In my local grocery store, I have found sweet rice flour shelved in the Asian food section. Hope you can find it there, cottagesweet and Pat. I remember the first dairy free smore my dairy allergic child had, now a winter treat. You're a genious! I thank you, thank you, thank you, thank you. I just found sorghum flour this weekend, I have sweet rice flour.. the rest should be easy to find. I am SO excited!! Can you hear me screaming out my joy here from WA?!?! I don't have that many good memories with my Mom, but I remember learning to feel just the correct crumbly for pie crust with my Mom. Your story about feeling the dough with Little Bean brought tears to my eyes. Putting good and delicious fuel in our bodies is so important to having a great productive day! that's it, you may officially be my hero! I've been telling my Aussie husband about graham crackers for years, but he of course doesn't quite get it seeing as they are not really available or known about in Australia. We just moved back to the USA though and I"ve been wanting to have a s'mores party and now I can with these gluten-free yummies- thanks! I had a try of these recently, I was too lazy to use all the different flours, so I got the bobs red mill gluten free baking mix, and I felt that it wouldnt be 'branny' enough, so I ended up adding oat bran, which I found to be a really nice enrichment. I know there is some debate about oats, so I'm not sure if its allowed, but I just thought I'd mention it. This recipe works great as described and the dough came together and rolled really nicely. I love that you gave the weights! I can't do the sugar on top so they weren't very sweet at all, which I might play with- more honey, less water? We're still getting used to gluten-free so they did seem a bit gritty even w/the fine rice flour but I expect that's just part of the deal. I do think they would be great as smores. Thank you! Shauna, this is grandioso and magnifico! (Spanish for great and magnificent). …and that Little bean is such a smart girl!. Just like Mom. As a reader from the UK I am happy to find the recipe in ounces 🙂 Can't wait to try the dairy-free version of these. Although in the UK I can't find sorghum and sweet rice flour. Will a combo of these work? I can find quinoa, buckwheat, millet and gram flour if they are any good? I squealed with delight when I opened this post! I'm off to buy sweet rice flour and a little honey. I have my scale and I'm good to go. Sending you an enormous hug for doing this! Thank you thank you thank you! The one key element I was missing for my favorite "gateau au fromage". Will make them this weekend! These are wonderful! Thanks for another great recipe! I inadvertently refrigerated the dough for 24 hours when my baking time was interrupted and I was worried. But I let the dough sit out until it was pliable and all was well. I did not need to add the liquid at the end, by the way. I can't wait for my GF son to some home from school and try these. I was afraid they'd be fragile but they seem sturdy enough to dunk! Congratulations Shauna. Your perseverance and creativity never cease to amaze me. What a lucky little girl Lu is that her mama bakes with her. Hopefully I can find the sorghum flour at the bulk or health food store. Smores would be great on the weekend. Oh how I miss graham crackers. Thank you! We've been on the same craving wavelength it seems. Just today I eyed some graham crackers at the store and thought I need to make them myself. And yesterday, I was thinking of using leftover broccoli stems for slaw. No one said anything about Nanaimo bars! Graham crackers are the key ingredient in the first layer. Those look delicious and the picture of the pie is just the inspiration I needed to get in the kitchen and do some baking. Lovely. Thank you for all the work that goes into creating your amazing recipe Shauna. Will be making these…and nanaimo bars…very soon. I cannot wait to try and make these! I was just saying the other day to my sister that I've not seen GF graham crackers yet! THANK YOU!!! These look so good. I had almost forgotten what a wonderfully, simple treat a graham cracker can be. Shauna! I feel like you read my mind! It's been raining non-stop in LA this week, and I've been hankering for s'mores and a cup of hot cocoa. Only problem was, I can't get graham crackers anywhere. Anyway, I just wanted to say thanks for making my weekend! I'm so happy you just posted this recipe. First attempt: ehhh. But, we'll try again. No guar gum have I; how can I substitute? I subbed x gum for it, so total x gum used was 3/4 tsp. Is that a decent fix? My dough never 'came together' in food processor, after 3 T water, nor 6 T & even a bit more. I don't know if the problem is my food processor. It seemed to just leave most of the flour/goo on the sides & a bit on the bottom. I used the dough 'blade'. Any sugggestions? Yay – no eggs!! I will for SURE be making this with my daughters (one is egg-allergic). I am so excited to see this post! I miss being able to use graham crackers in cheesecakes! I am going to try this soon! Hi Shauna! Just thought I'd let you know I made your crackers this weekend, along with non gluten free' crackers, for a dinner party! They both turned out great, and some even liked the gluten-free version better than the other one. i had to make a couple of substitutions (no sweet rice flour or guar gum), but i think they were great! thanks! Can't wait to try these! I agree the commercial ones are too sweet and I have MISSED graham crackers! Thank you very, very much for that recipe of graham cracker. I've been wanting to do some piecrust with these crackers for such a long time. Thanks again! made these today and they are so so so good!!! Even my non-gluten intolerant husband stated that he liked them better than the store bought ones, and I'm inclined to agree. I had to go on a 2 hour trek to find guar gum, but other than that, this recipe was brilliantly easy to follow and turned out exactly as it was supposed to. YAY! Just made some of these and they are very good and incredibly easy to put together. Can't wait to put some chocolate and marshmallow on them! Thank you for sharing such wonderful recipes and love of the kitchen with us. You certainly are an inspiration. Mochiko brand sweet rice flour is the familiar brand but in Asian markets looks for glutinous rice flour, spelt with 'i' not 'e', made from sticky rice and normally half the price of Mochiko brand. I did a side by side baking of both flours and found no difference in my gf recipe. I have to try your graham cracker recipe so I can include it in my gluten free baking classes. Like everyone store bought gf graham crackers are plain strange. I made these this afternoon… they are delicious! I subbed quinoa flour for the brown rice flour… this is going to be a regular recipe in my house! My 4 year old & I are invited to a bonfire next week so I did a mad search for GF/DF/SF graham crackers, found these and did a test run. Actually, the first batch was so good that I got up at 5:30am to make another batch. They were excellent!! Thank you for such an amazing recipe. We made some with the cinnamon sugar topping (which were great!) and some without (which we liked even better since we prefer things a little less sweet). I can't wait to bring these to our event and use in the future for playdates, etc. Since brown rice does not always work for me, I want to try millet flour or amaranth flour have you used any of these flours before? I can not wait to try this recipe. I like using guar gum and xanthan gum but I have not had much fortune using the combination of both gums in my recipes but I will try this one. Turned out great and my 3 year old who is allergic to EVERYTHING loved them! He even asked me to make some to take to preschool. Thanks for sharing! Hi, I'd love to try it, what do you think I can use to replace the butter? Do you think Spectrum shortening will work? How about EVOO? Thanks! We made these this evening for a camping trip, and they are so close to the real thing that I nearly forgot that they were GF. Shauna, you rock! Since these are for s'mores, I put some chocolate chips on them right out of the oven; wait a few minutes, and use a spatula to spread the melted chocolate. We won't have to fumble with chocolate bars in the dark! Ok. I tried this today, was so excited to taste this great sounding recipe, and to my utter disappointment, it was a complete disaster! Here is what I did. I was hoping someone would have some suggestions for what I should fix. I'd love get this right. So, first of all I did not use a scale. Also, some of the mixture of dry ingredients spilled so I added an additional teaspoon of each type of flour. Also, I used soy butter instead of real butter. Did that make all the difference? Any tips would be much appreciated. Thanks! I got a bit carried away rolling these out and ended up with a very thin cracker. They were very good though. I used a silpat to bake and roll them on. I will be making these often. Thanks! I LOVE this recipe! I couldn't find sorghum flour so used buckwheat instead and mad corn free baking powder ( the husband is allergic to corn and wheat). So amazingly good. Will totally make more tonight! I made this recipe specifically to turn the crackers into crumbs for cherry cheese cake. Well, it took all my willpower not to eat the whole batch of cookies as soon as they came out of the oven. Delicious! And for the crumb crust I made from them? Even my gluten-eating husband says that it is the best crust he has ever eaten. Thanks, Shauna, for a fantastic recipe! Oh yes, I forgot to mention that I love it that you give weights instead of just cups and spoons. Being German I've always cooked and baked like that. We don't even have measuring cups and spoons over there (except for liquids). And since I make my own butter and it doesn't come in sticks that way :-), weighing it was so much easier than trying to press it into tablespoons! Finally….after months of having this bookmarked, my two little sous-chefs and I made these yesterday. Absolutely outstanding. The recipe could not be easier to follow or prepare. The smell of these baking was torture. I might have burned my tongue just a tad sampling – I simply could not wait for them to cool any longer. Even if boxed GF graham crackers were readily available, one taste of these and you are certain to never consider anything else. Thank you for bringing us the best smores ever! I’m hoping to make these for our camping trip this weekend but…we can’t do sorghum flour. Any suggestions on what would work in place of that? Also, for all those who can’t find sweet rice flour I’ve used a mixture of regular rice flour and tapioca starch in other recipes with luck, hope that helps! We went camping this weekend and my kids wanted s’mores, but we’re vegetarian and my youngest can’t have corn products so store-bought marshmallows aren’t an option. I made my own marshmallows using this recipe: http://www.hungrybrowser.com/phaedrus/m010702.htm#2 Of course I don’t have marshmallow root powder, but I did use a combination of arrowroot and tapioca starches (next time I think I would use more of these to make the fluff stiffer) and maple sugar and they were delicious with Enjoy Life choc! It was such a great feeling to give my kids a “normal” camping treat that was free of allergens! what is the purpose of using both xan and guar gum. why not just use one alone? is there a science behind that method? I can’t wait to try these! I have been wanting graham crackers lately. I know what you mean about the cinnamon/honey combination. Reminds me of childhood. That used to be one of my favorite snacks. Thank you! I have wanted grahm crackers so badly ever since I started taking gluten out completely. I am in highschool so it has been quite the challenge to bake new recipies, have them flop, go to work, and go to school. At last real recipies! I’m planning on using a bunch of your recipies for my party on monday; but I won’t tell my friends their gluten free. Your grahm crackers are delicous, I just made a batch now and they are amazing. Thank you, Thank you! Hi! I am so happy to have stumbled upon your site…my son’s teacher’s wife has celiac and as a baker it has been hard to not send treats in to school! I have a batch of marshmallows made and ready but they need more options than hot chocolate…Can I make these with gluten-free AP flour? Or is it best to buy all the ingredients individually and mix? What’s the difference between xanthan and guar gum? Can I just use all xanthan gum? These look delicious. What’s your experience with making a double batch and freezing them for a future baking? How well do the prepped ingredients hold up in the freezer? They are different, and do different things (and chia and flax do different things yet – I love flaxmeal gel as an egg substitute in cakes/muffins, but find I do need to add a little extra baking powder or soda). HI! I’m so excited to have found you and this recipe. Since going GF we have been using milled golden flax seed a lot. When we sprinkle it on our yogurt they think its grahm cracker crumbs. 1) Would adding a bit lend to the nuttyness that some say is missing? 2) How should I go about adding it in? Do i need to adjust the dry ingredients accordingly or just the amount of H2O that is required? Anyone tried the graham crackers with Spectrum shortening or an Earth Balance product? Question! My hubby (gluten intolerant) absolutely loves Reese’s peanut butter cups. I saw a recipe for homemade ones on Pinterest but one of the key ingredients is 2 cups graham cracker crumbs; therefore how I came across this recipe (which sounds wonderful!). I like to surprise him with good GF recipes. How would you suggest I make this for the crumbs only? The pb “cups” are a no-bake recipe, so I would assume I would have to bake this first. Would you just crumble it raw into a pan and then bake the crumbles or bake in a sheet pan and then crumble? Figured since you created it, you would know best. Help appreciated! Thanks for your great recipes! Yum, yum! I am enjoying hot grahams now! We are camping with our 1.5 year old celiac daughter next weekend, and can’t bear the thought of her not getting s’mores with everyone else. Thank you for the great egg-free, gluten-free recipes. Thank you for this recipe! I’ve been gluten-free for 3 yrs, and graham crackers are one of the “gluteny” foods I miss most. I made these w/o the guar gum (I couldn’t find it), and they were still great. Wow! I am very excited about this recipe. My two little boys have never had a proper ‘smore because of extensive allergies. We are taking them camping next week and I was so glad to find this recipe. One question: is there an alternative to the sorghum? My boys do not tolerate it — nor most other grains… gf or not. Would it ruin the recipe to just add onto the rice flour and tapioca measurements? Thanks! It’s worth a try! i’ve never made it that way but if you bake by weight, then it’s worth a try! Amazing!!! Thank you so much for this recipe… I have a batch in the oven right now and am anxiously waiting to see how they taste! My youngest is gluten intolerant, and we’re planning a camping trip in a few days. I was so nervous that either (A) the older ones would be VERY grumpy having to give up s’mores, or (B) he would be quite upset if we did make them and he were excluded. This may be just the answer to our troubles! I wonder what the best storage options for leftover crackers might be? I’m making them tonight in hopes of using them in 3-5 days. Keep at room temperature? Refrigerate? Freeze? We are taking a LONG camping trip, but the first few sites have a fire ban. We want to do Smores about 5 days in. If I make these before we leave, does anyone know if they will keep until we get to a fire friendly campground? Thanks ALL!!! Mine kept for a two weeks and tasted just fine! I hope that helps. I can’t wait to make these. I, too, have missed graham crackers since chaining to a glutenpfree diet. Baking with your little one is invaluable, what a great way to learn. Thank you! Wondering if these taste like graham flavor of “real” graham crackers? Do you know of a way I could make these chocolate grahams? I recently went gluten free as a last ditch effort after battling with colitis relapses for over a year. I feel so much better now but have found myself missing those glutenous foods that spark memories. For me, there is nothing that sends me back to childhood like campfires and s’mores. So when I was planning a summer camping trip, I was pretty downtrodden about the fact that I would have to forgo s’mores this year (and every year after for that matter). That is, until I found this recipe 🙂 What an adventure! They turned out delicious! Next time, I will probably roll them thinner and bake them longer to get that crispness but they were that final puzzle piece for our trip! Thank you. I made these for our camping trip and found that they were much better fresh than they were after a few days. Loved the graham crackers my dough was dry when I got it out of frig so I thought I’d have to use graham cracker crumbs instead but I rolled it out best I could and they were wonderful smelled and looked delicious and since making a cake from this site and crackers I am hooked on GF baking never dreamed it could be so good. Thanks a million. By the way my family of 6 is all on the diet due to my celiacs, I was unable to keep from contamating myself so I had to put the entire family on diet and everyone is happy with what they are eating thanks to a great website as this one. I have been looking everywhere for a gluten free graham cracker and I think your recipe will do the trick! Thank you. 2 questions. 1. Can you give me any suggestions to make this a dairy, egg free recipe? 2. Is it necessary to use both guar gum and xantham gum? What does the guar gum do for this recipe? Deb, you can use psyllium husk instead of guar and xanthan gum. Same amount. That makes this recipe earlier. I’m afraid I don’t know how to make it dairy and egg-free. But other people here will! These are amazing. My husband and 2 boys ate almost the whole batch within an hour after I took them out of the oven. I’ve been baking gluten-free only for about 3 months, after I found out my 3 year old can’t eat wheat, dairy, egg, soy, corn and nuts. Ugh! I have been desperate to find a graham cracker recipe that’s “not yucky” and these definitely fit the bill. The adjustments that I made are: I used 1 teaspoon of guar gum and no xanthan gum (we can’t do xanthan b/c it’s a corn derivative), I used my homemade baking powder (2 parts arrowroot starch/2 parts cream of tartar/1 part baking soda) and I used Spectrum shortening instead of the butter. I also rolled the dough out to 1/8″ thick, just to make it look more like the ones on the Honey Maid box. Thanks a million Shauna! I made these last weekend and I’m working in my second batch- they were AMAZING! I did not have guar gum so I used all xanthen gum. I had white rice flour instead of brown rice flour. Even with these substitutions, they came out amazing and made delicious s’mores. We had several children at our home who preferred them to the regular graham crackers. They don’t taste exactly like regular graham crackers, but are light and delicious with hints of honey and cinnamon. I found that the cinnamon sugar topping is a real must. I was thrilled with how well they held together- even holding chocolate and marshmallows! THANK YOU!!! Shauna, Thank you so much for sharing your talents with us. I adore your writing. Quick question for you: in a previous post talked about leaving out the gums, do you know if that would work with this recipe? Wow! Found the recipe about a week ago because I realized I needed GF graham crackers for s’mores when camping this weekend  ’cause what’s the point of camping if you can’t have s’mores?! Initially the recipe looked a little daunting, even with your guarantee that it only looked complicated. I tried to find the S’moreables pre-made GF grahams but my Whole Foods didn’t have them, so I grabbed the ingredients for these instead. OH EM GEE soooooooo easy, and sooooo delicious! Thank you so much for this recipe! Oh, also, mine turned out pretty dense (which I don’t mind) but I was wondering if yours did as well, or maybe I needed to bake them a bit longer or roll the dough a little thinner? These were DELICIOUS! I will leave them in oven a little longer next time because I loved the crispy parts! I left out the gums and substituted the ground chia seed sludge, but then i read you said to substitute psyllium husk. Would this work better? these look amazing! this will hit the spot for my gluten free son! I’m wondering if I can use gf all purpose flour rather to to gather all the individual flours together. Thanks for the recipe I’m sure he’ll enjoy!! I love these. Rather than going through the trouble of rolling out the dough, I rolled it into a tube shape then squared off the sides. Then I kept them in the fridge a bit longer and sliced the cookies. MUCH easier. Nice squares of GF graham crackers. Also, I iced some and they were great. That is a very clever idea! Can I switch out all the different flours for an all purpose gluten free flour?